So, a precocious puppy and love struck horse are clearly the animal darlings of this year's Super Bowl commercial showings. But in case you're craving for more equine and canine buddy stories, here are a few other heartwarming examples of interspecies friendships -- refreshingly real, not intended to sell you beer. It's probably fair to say that horses and dogs have been the most loyal friends to humans throughout history, so perhaps it shouldn't be too surprising that the two beloved creatures would hit it off with one another as well. Meet Lucy and her good friend Whisky Brown. The Portuguese Water Dog and stallion pal are an inseparable pair, delighting in each other's company on a ranch in East Texas. Even in the midst of a little social unrest on the part of their owners, dogs and horses aren't afraid to strike up a spontaneous friendship. 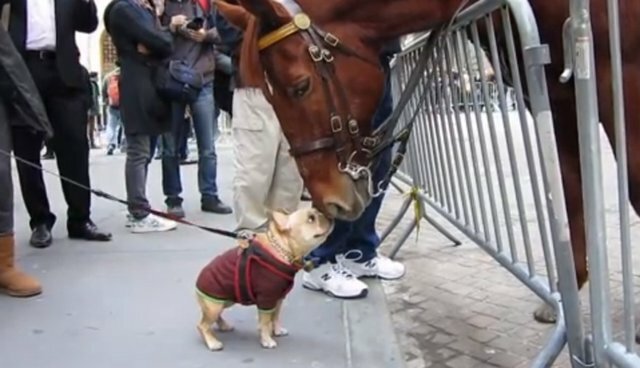 Here, a gregarious French bulldog makes an unlikely partner in play with an NYPD police horse who looks happy to be distracted from his duties. It apparently didn't take long for this rescued pony to find a new friend in a playful lab as the pair engage in a frolicking game of keep away with a T-shirt -- no humans necessary (this writer reports, with a tinge of jealousy). Given the sweet-natured spirit of our canine and equine companions, it's hard not to suspect that there are countless other real-life dog and horse friendships blossoming daily, out of sight from their owners -- maybe even now, as the world sits transfixed in front of the television, gushing over a carefully crafted advertisement for booze.